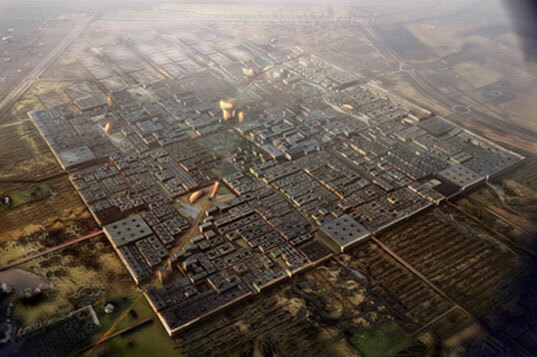 United Kingdom based architecture firm, Foster and Partners unveils their plans for the Masdar Initiative – a 6 million square meter dense walled city in Abu Dhab, United Arab Emirates (UAE). The city is claimed to be the world’s first zero carbon, waste free city. 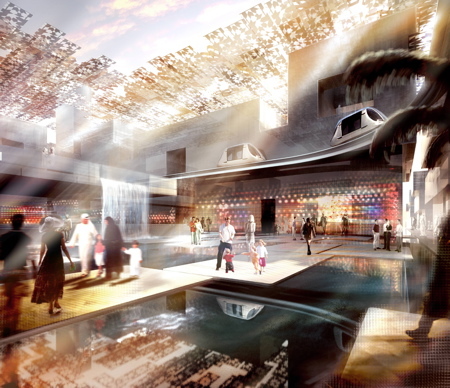 The principle of the Masdar development is a dense walled city to be constructed in an energy efficient two-stage phasing that relies on the creation of a large photovoltaic power plant, which later becomes the site for the city’s second phase, allowing for urban growth yet avoiding low density sprawl. Rooted in a zero carbon ambition, the city itself is car free. With a maximum distance of 200m to the nearest transport link and amenities, the compact network of streets encourages walking and is complemented by a personalised rapid transport system. The shaded walkways and narrow streets will create a pedestrian-friendly environment in the context of Abu Dhabi’s extreme climate. It also articulates the tightly planned, compact nature of traditional walled cities. With expansion carefully planned, the surrounding land will contain wind, photovoltaic farms, research fields and plantations, so that the city will be entirely self-sustaining. The firm also won an international design competition for the new La Ciudad del Motor (Motor City) in Arago, Spain that featured sustainable energy and design.